The SUNNINGHILL TEAM consisting of Richard Piner, Craig Marsh and Ian Rose won a close semi final against Addlestone British Legion to reach the final. WEST BYFLEET put up a convincing performance in the other semi winning the first two frames to add to their 49 point handicap. Staines's Tom Howick despite having a monumental task to overcome a 110 point deficit started in great style putting 40 + points on the board without reply. An unfortunate in off to the middle when in full flow stopped him from further reducing the gap and Michael Doherty sealed a famous win with some spectacular pots of his own. Sunninghill set to concede 91 in the final got a shock in the opening frame when Michael Doherty edged the frame by 13 points to take West Byfleet into a 104 point lead. Craig Marsh played the frame of his life with a superb all round performance to win by 91. Ian Rose needed little encouragement to maintain the momentum knocking in an early 41 break. Dave Wood potted some great balls to keep his team in the match but was forced to concede the match needing snookers on the blue. All matches were played in good spirit, Sunninghill were deserved winners but all teams played there part in an entertaining evenings play. 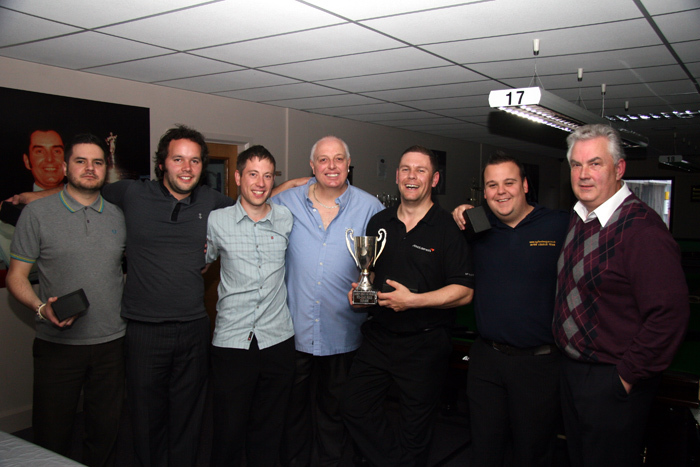 Thanks to Jim Angus for refereeing and to the Chertsey Club for use of their snooker room.